Small perturbations of simple eigenvalues with a change of parameters is a problem of general interest in applied mathematics. The aim of this work is to study the behavior of a simple eigenvalue of singular linear system family E(p)x' = A(p)x + B(p)u; y = C(p)x smoothly dependent on real parameters p = (p1,...,pn). Small perturbations of simple eigenvalues with a change of parameters is a problem of general interest in applied mathematics. The aim of this work is to study the behavior of a simple eigenvalue of singular linear system family E(p)x' = A(p)x + B(p)u; y = C(p)x smoothly dependent on real parameters p = (p1,...,pn). Garcia-Planas, M.I. 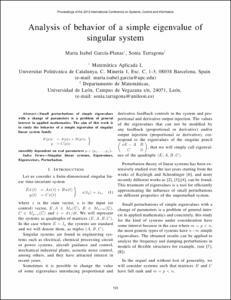 ; Tarragona, S. Analysis of behavior of a simple eigenvalue of singular system. A: International Conference on Systems, Control and Informatics. "Proceedings of the International Conferences". Venecia: WSEAS Press, 2013, p. 123-129.